Yogurt is hung to make it thick. 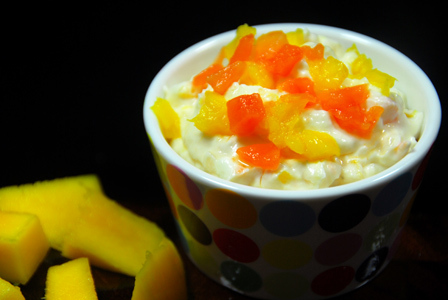 Fresh ripe mango is very finely chopped and mixed with hung yogurt along with fine sugar. Serve mango shrikand immediately. Makes: around 3 Servings of Mango Shrikand . Crush the cardamom pod and remove the seeds and grind the seeds into very fine powder. Grate the nutmeg for the nutmeg powder. Wash, peel and very finely chop the ripe mango. Tie plain yogurt in a clean muslin cloth and hang it in refrigerator (tie the ends of cloth to the rack) for 6 – 8 hours with a bowl underneath to collect the whey. Alternatively, hang it above the kitchen sink for couple of hours and then refrigerate for an hour or so. Remove the thick yogurt onto a mixing bowl, stir in chopped ripe mango, sugar, cardamom powder, nutmeg powder and sliced almonds. 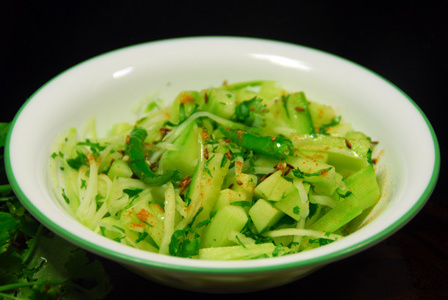 Garnish with sliced some chopped mango and serve mango shrikand immediately. Notes: Make sure to make the yogurt extra thick if you use the mango juice to thin the yogurt. Suggestions: Make sure to use full fat yogurt for better taste. Variations: You can also add honey instead of sugar if you wish. Few tablespoons of mango juice can also be added to the yogurt if you wish. Yogurt is hung to make it thick. Fresh mango and papaya are peeled and very finely chopped. They are then mixed with hung yogurt along with sugar. Serve mango papaya shrikand immediately. 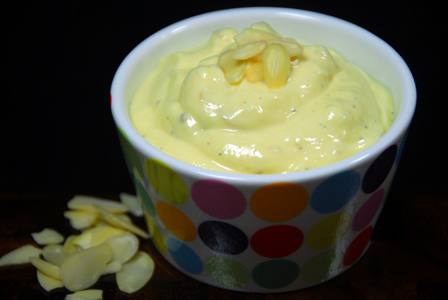 Makes: around 4 Servings of Mango Papaya Shrikhand. Crush the cardamom pod and remove the seeds and grind the seeds into fine powder. Peel and very finely chop the mango and papaya. Remove the thick yogurt onto a mixing bowl, stir in sugar. Then stir in chopped mango, papaya, cardamom powder and sliced almonds. Serve mango papaya shrikand immediately. Notes: Make sure to make the yogurt thick before mixing the fruit. Variations: You can also add honey instead of sugar if you wish. Few tablespoons of mango juice can also be added if the yogurt is too thick. Other Names: Mango Papaya Shrikhand. Chinta Chiguru Mamidikaya Kandi Pappu. Raw mango is peeled and pressure cooked. 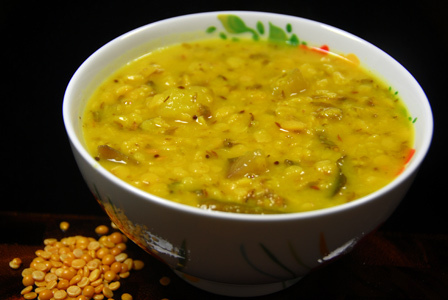 Toor dal is pressure cooked and finished with cooked raw mango and dried tamarind leaves. Serve mango tamarind leaves dal with steamed rice or with roti. Makes: around 4 Servings of Mango Tamarind Leaves Dal. Peel and roughly mash the garlic cloves. Wash and keep aside dried tamarind leaves. Peel and chop raw mango into small pieces. Wash toor dal with water and strain it. Pressure cook toor dal in 2 cups of water for around 3 whistles. Pressure cook chopped mango and green chiles with few splashes of water at the same time in a separate vessel. Heat oil in a small pan on medium heat, add garlic cloves and all talimpu ingredients in order. When mustard seeds start spluttering, add cooked mango and green chiles and tamarind leaves. Boil for a minutes, add cooked toor dal, turmeric powder and salt. Boil the dal for couple of minutes and remove from heat. Serve mango tamarind leaves dal with steamed rice or with roti. Notes: Make sure to cook the mango well. Suggestions: Dal wouldn’t cook further once mango is added. So make sure toor dal is cooked well before adding it to the mango. Variations: You can also use fresh tamarind leaves in place of dried tamarind leaves. Other Names: Mango Tamarind Leaves Dal, Chinta Chiguru Mamidikaya Kandi Pappu. Thick poha / flattened rice is added to the yogurt / dahi. Raw mango is grated and added to the poha soaked in yogurt. Finally whole spices are fried in oil and added to the poha mixture. Serve mango dahi poha immediately. Peel and either julienne or grate the raw mango. In a mixing bowl, whisk together yogurt and around quarter cup of water. 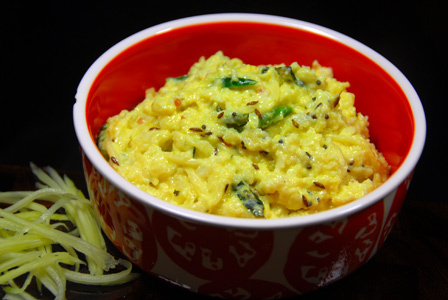 Stir in poha, grated raw mango, turmeric powder and salt. When mustard seeds start spluttering, add sliced green chiles. Fry briefly and remove from heat and add to above poha bowl. Stir well and serve mango dahi poha immediately. Notes: Make sure not to over stir once the poha is added to yogurt. Suggestions: Adjust the consistency with water. If raw mango is not sour enough, add few drops of lemon juice to the dahi poha. Variations: You can also add roasted peanuts and chopped cilantro to the poha mixture. Other Names: Mango Dahi Poha, Mango Yogurt Flattened Rice, Perugu lo Atukulu.